KABUL, Afghanistan -- Hours after the death of Pakistani Taliban leader Hakimullah Mehsud, the militant group's counterparts across the border condemned the "cowardly U.S. drone attack." "If America believes that by martyring mujahedeen they will somehow create a void and reach their selfish aims then they are greatly mistaken," the Afghan Taliban said in a statement. Officials blame Mehsud's Pakistani Taliban for the deaths of at least 40,000 civilians and 5,000 troops during its decade-long insurgency against the country's government. The Pakistani Taliban have also been known to support their Afghan brothers-in-arms, who are a separate group under the leadership of the elusive Mullah Mohammed Omar. 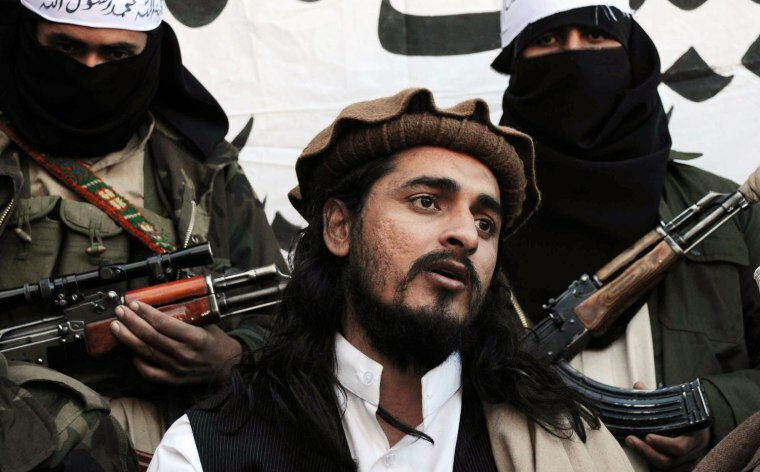 But despite being linked to such a huge death toll and vows of revenge in the wake of Friday's drone strike, the Pakistani Taliban aren't considered the country's biggest threat to the U.S. Other powerful and volatile Taliban factions remain. "The most dangerous and capable group within the larger Taliban movement is the Haqqanis," a senior ISAF Joint Command official involved in planning counter-insurgency operations told NBC News, describing them as the "most successful" militants in the region. Due to their wealth and deep links to local tribes and, one Western diplomat called the Haqqanis "the Kennedys of the Taliban movement." The Pakistan-based Haqqanis are among the United States' most feared enemies in Afghanistan. They have been blamed for many of the more than 2,000 U.S. military deaths in the country. Operating in the "P2K" -- U.S. military-speak for the eastern Paktia, Paktika and Khost provinces -- the Haqqanis are violent, well-organized and deeply embedded in the Taliban movement, according to Western officials. The Haqqanis established themselves as key players in the region during the war against the Soviet Union after the 1979 invasion of Afghanistan. They are led by Sirajuddin Haqqani, the son of the now-retired Jalaluddin Haqqani -- a former mujahedeen commander. The Haqqanis have created a new axis of insurgency in the "tribal arc" from Pakistan’s Waziristan all the way to Kabul. In the 13th year of the conflict in Afghanistan - the longest international military engagement in American history - with most Western forces set to withdraw by 2014, the Taliban movement has evolved. In Afghanistan, the Taliban is fighting a very different insurgency than the regime that was easily displaced by U.S. forces in the wake of the 9/11 attacks. The Afghan Taliban remains the "core" insurgent movement operating in Afghanistan’s southern provinces and the east, with increasing activity in the north-east as well as Kabul’s surrounding areas and even the capital itself. According to Mullah Waqeel Ahmad Motawaqil, a former foreign minister of the Taliban regime who previously served as Mullah Omar's chief-of-staff, the Afghan Taliban is a complex and highly organized movement. They work as a “multifaceted military, political, cultural, administrative and religious insurgency, with a key component being the shadow government and its committees and sub-committees overseeing the group’s religious and military objectives in every province in Afghanistan," Motawagil said. Wahid Mojdah, a former Taliban official and an expert on the insurgency, described the Taliban as "like a sect, a group of people dependent on the leader. "They accept Mullah Omar as the Commander of the Faithful," he added. "If they do not accept this they will be committing a sin. This is something very different from other parties and militant groups. And this is what keeps the movement going from the north of Pakistan to the south of Afghanistan." Mojdah estimated that between 10,000 and 30,000 Taliban fighters are operating in eastern and southern Afghanistan. A senior ISAF official would not provide an estimate, but admitted that the insurgency is strong "enough to maintain a level of violence." Most experts agree that today's Taliban is capable of carrying out a more lethal standard of operations. While Western education was banned by the earlier regime, the modern Taliban propaganda machine uses the Internet skilfully. Operationally, Taliban tactics have evolved, too, mimicking those of Western special forces that they have been battling for over a decade. One former special forces operative from a NATO country told NBC News that “complex attacks, probing, using kids as carriers, magnetic bombs, leaving caches of weapons in abandoned buildings, diversionary tactics, wearing Western clothing." Major General Reinhardt Golks, the deputy commander of ISAF’s Joint Command, said the Taliban appeared to be focusing on fewer "higher quality" incidents "with higher impact on the population." NBC News' Akbar Shinwari and Fazul Rahim contributed to this report.